Way back in April of 2010, Liz and I were at a crossroads with Metro Stars. Between the coaching, the administration, the cleaning, the accounting, and all of the other things you do at a young start-up company, something had to give. Every day we asked ourselves, “Can we find someone that shares our passion and values to take this to the next level?” Well, sometimes if you ask, the universe answers. Liz returned from the gym one morning to report that we had a voicemail from a man by the name of Manuel Bonilla, and that he was interested in applying to become our women’s head coach. A Google search later, we discovered that we already had something in common with this mysterious person, an athlete! One of our old gymnasts went on to compete on the gymnastics team at the University of Bridgeport, and incredibly, Coach Manny happened to be the assistant. She gave him a glowing recommendation and described a man with a positive attitude, a strong work ethic, and a passion for the sport of gymnastics. Needless to say, we offered him a job immediately! Manny, Liz, and I worked side by side for the next couple of years. He and I would sweat together in the summer as we taught those late night tumbling classes. He would be patient with me when I wanted to measure something two or three, or maybe five more times, before we actually drilled the concrete. Over the course of that time we managed to improve almost every aspect of Metro Stars, but I’d have to say that my favorite memories are of the days that we would stay late into the night to talk about anything and everything. 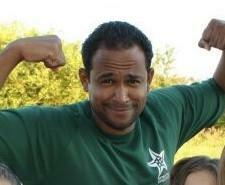 Yesterday the Metro Stars family lost one of its very early team members when Coach Manny lost his battle with cancer. This man was a lot of things to Metro Stars, including our first full-time team member, our first women’s head coach, a mentor to countless coaches and athletes, but above all else, he was our friend. May he rest in peace. Today our thoughts and prayers are with Kathy, Aylanie, and Ohanis Bonilla as they mourn the loss of their husband and father, Manuel Bonilla, at the age of 38.